Lately I’ve been thinking a lot about my spending habits. I sometimes have these really awesome moments when I am keeping to my budget, spending wisely, and stashing lots of money away into savings……. But then, I have my moments where I S.T.R.U.G.G.L.E. I shop impulsively. I buy things without consulting the budget. I develop a “I need it so I get to have it” mindset. Does ANYONE else have this happen???? I ALWAYS know this behavior is wrong. I ALWAYS know that I shouldn’t be buying “x,y, and z.” Yet, I ignore that small voice of reason and just keep on spending. I have learned that these overspending urges are usually the result of a trigger. SOMETHING going on in my life (usually emotionally for me 😉 ) that causes us to want to overspend. The other day I got an urge to SPEND. Like, really really spend. I wanted to buy decorations for my home and I wanted to buy myself a few new shirts and I wanted to go out to eat and I wanted to take my daughters on a back to school shopping spree and I just.wanted.to. SPEND MONEY! I thought a lot about my emotions in that moment and I realized that I was feeling frustrated. I was frustrated by my budget. I was frustrated that I was so limited with the amount of money I am “allowed” to spend each month. I just wanted to throw the budget in the garbage and show that budget that I can spend what I want when I want! Once I realized what I was feeling, I knew that I needed to change something in the budget. As a parent, I always ALWAYS choose to have money budgeted for the kids wants/needs instead of budgeting for my wants/needs. Which I am so HAPPY to do for them, but I was limiting myself so much that I became frustrated which resulted in me wanting to overspend! So, I decided to change my budget. Next month I will be budgeting more money for my personal spending money. 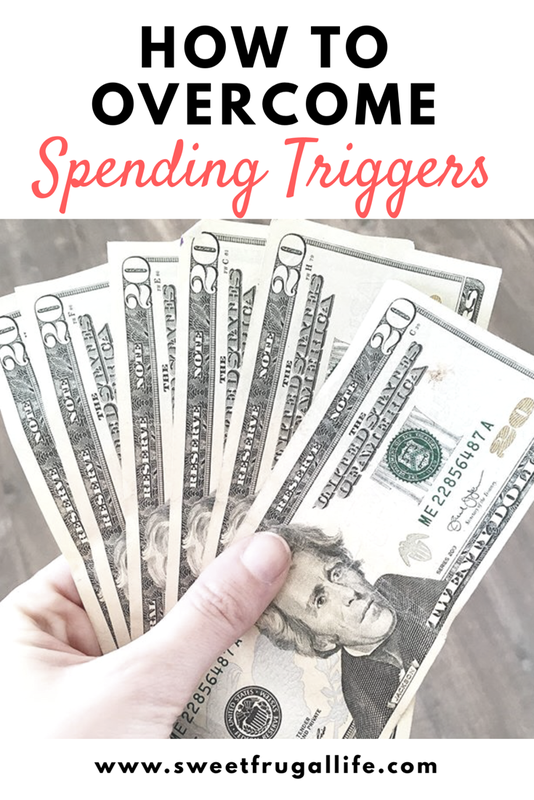 I am hoping that by doing this it will eliminate that trigger and help decrease those spending urges. Everyones will have different triggers and you won’t experience the same trigger every time. I tried to brainstorm below a few possible overspending triggers and a suggested solution. Trigger: Overspending because you are bored and shopping is a form of entertainment. Solution: Develop a new (cheap) hobby. Ask a friend to join you in the hobby to help keep you accountable and active with it. Trigger: You lack confidence and are trying to boost your self esteem with new purchases. Solution: Read some self help books (from the library) about confidence. Learn to develop inner confidence without needing to spend money. Trigger: You are upset or emotional and use shopping as therapy. Solution: Find a new way to release your emotions. Go for a run or walk. Call up a friend or watch a favorite movie. Find a non-spend alternative to help you calm down. Trigger: Feeling jealous when you hear how friends have been spending their money. Solution: If your friends are a temptation to spend money you need to distance yourself from them. I have unfollowed friends on social media before because their posts trigger my urge to spend money. If you need to make some new frugal friends, do it! Just do whatever it takes to delete that temptation. Trigger: A huge sale at your very favorite store. Solution: Delete all e-mails from that store so you won’t even know when they are having a sale! Also, remember that there will ALWAYS.BE.ANOTHER.SALE. This is the truth! You can find the good deal again, once you have budgeted and planned for the expense. Trigger: A friend invites you to do something that will encourage you to overspend, maybe a day of shopping or a weekend trip. Solution: Be up front with your friends. Tell them your spending limits and the activities that you will be able to or won’t be able to participate in. Kindly ask them to stop inviting you to the activities out of your budget. What are your personal spending triggers? What are the solutions YOU have come up with to help overcome those triggers? Share with me in the comments so we can help each other out. Great post. I find boredom is a big trigger for me. Also being around friends who are in our same income bracket and seem to just be spending constantly and getting whatever they want! I get jealous until I remember the feeling of getting a bill and being filled with dread. I’m not so jealous of that! Way to overcome that trigger!! I really feel like you hit the nail on the head- I get really spendy when I’m stressed or going through life changes. Or if things are really tense or unpleasant, I just look for ways to change things up or break the logjam- spending on things, changing hairstyles (bangs, anyone? ), anything to change up the norm. Ultimately it serves as a distraction and rarely a solution to a problem. I’ve been able to stop myself “just browsing” by calling it what it is: shopping, but haircuts I have a 1 week waiting period and an accountabilibuddy to consult. Maybe I should enlist help on a 1-week spending freeze buddy! I LOVE all of those ideas! Thank you for sharing! I think we all need an accountability buddy when you comes to spending! Thanks for sharing! This is so true… we oftentimes fail to reckon with our spending triggers. I read once that when we tell ourselves that we cannot, we want to do it more. It’s such a mental game.